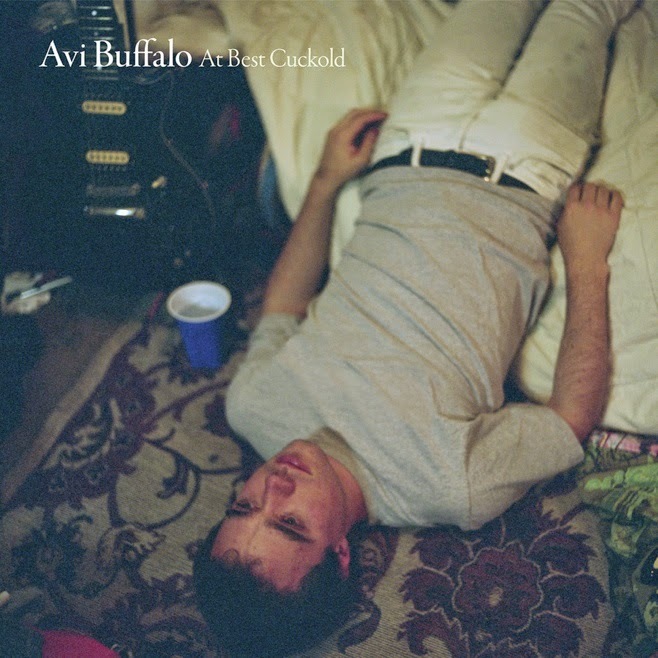 With its eponymous debut album Avi Buffalo found a place in my 10 favorite albums list of 2010. I vaguely remember pondering on going to a show I never went to and then all went quiet on the band. This went as far as me sort of missing the release of At best cuckold. Luckily there's always someone like Erwin Zijleman to remind me (http://wonomagazine.blogspot.nl/2014/11/at-best-cuckold-avi-buffalo.html). This album is so good that it deserves a second review on this blog and here it is. There's a distinct difference between 'Avi Buffalo' and At best cuckold. The charming, insecure sounding indiepop/rock of the debut has made way for a much larger sound. Without losing the ability to write and record fine songs. It's not as if this loudness and filling obscures weaker songs. To the contrary. Avi Buffalo retains its high level of songwriting while presenting them in a self-confident way. Growth is another word for this process, and shorter. Looking at who plays in and has played in Avi Buffalo it is easy to conclude that at heart this is a one person band. Avigdor Zahner-Isenberg is the central man and finds people to work and tour with. He's the songwriter, singer, guitarist of the band. At present he's joined by Sheridan Riley, the only long time collaborator of Zahner-Isenberg, Doug Brown and Anthony Vezirian. Yesterday that was different, tomorrow there most likely will be different musicians filling in different spots as well. Having listened to the album for a couple of times now, it is totally clear that Avi Buffalo deserves a spot in the new psych movement that has grown up and sort of disappeared again since 2012, while on the other hand making several totally timeless great pop melodies, that are interspersed with some loud lead guitars melodies that go off in different direction. Some even come close to Frank Zappa's signature sound. The combination is almost irresistible. The soft voiced, high singing Avigdor, the soft flowing pop melody and the wild, ferocious outbursts of the electric lead guitars; one left, one right, going for it the whole 9 yards. 'Oxygen tank' tells it all if you listen to it. The more rock oriented songs, e.g. 'Memories of you', are very convincing as well. The melody, the way the song plays out, it is all very much o.k. "Think it's gonna happen again' is somewhere in between rock and ballad and psychedelic weirdness in the background. The variety of songs on At best cuckold is another strength of the album. From a Breadlike, acoustic intro, to a 1967 psychedelic outing, it's all there. The Beatles and Peter Skellern? Avi Buffalo has incorporated it all. There's even a Herb Alpert sounding horn in 'Overwhelmed with pride'. I won't claim a unique mix, but certainly a 100% convincing mix. At best cuckold is only a 10 song album. That is 2,5 song per year. This does not sound much, and I'll not rant about artistic growth of several 1960s bands in a few years, the growth Avi Buffalo shows, seems to show that this was the time Avigdor Zahner-Isenberg needed to get to this point. From a high schooler who was responsible for 'Avi Buffalo' to the young 20 something is At best cuckold. A well chosen title as there's no comparison between the two albums. From teenage first love to the first real relationship? It seems like it.